Squid and octopi do it. They change their skins to blend into the color and textural patterns of their environment. Specialized skin cells, called chromatophores, allow them to change color, reflection or even refraction. This also allows them to communicate with other octopi for mating or to warn competitors away. Humans do it too. They change their skins with tattoos. Body decorations such as tattoos can be expressive and alluring or even a little scary. But tattoos are also permanent. If we could display tattoos that were transient (even animated!) it would be yet another way to express ourselves, our thoughts or even our health. Gina Miller (also known as "nanogirl") is an artist who last year produced images on a concept first developed by Robert A. Freitas, Jr., a senior research fellow at the Institute for Molecular Manufacturing in Palo Alto, Calif. In his futuristic treatise, a display would be implanted just below the surface of the epidermis so that its light was visible through the translucent skin on the back of one's hand or forearm. 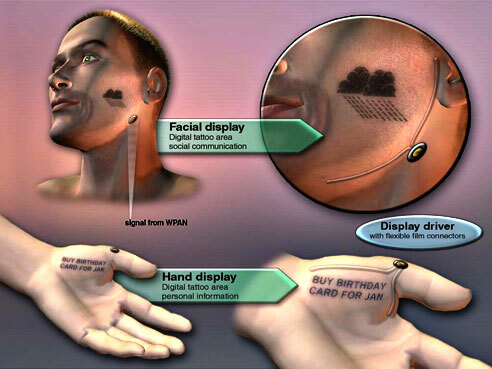 Dermal display depicting various medical conditions. Gina Miller & Robert A. Freitas, Jr.
©2005 Gina Miller & Robert A. Freitas, Jr. This "dermal display" (featured on the winter 2006 cover of Cryonics magazine) would consist of about three billion light-emitting nanorobots capable of rearranging themselves to spell out words and numbers and produce animations for the display. To turn on and control the display, you simply tap it with your finger. The idea was first mentioned in "Nanomedicine," a series of books Freitas wrote describing possible future uses of nanorobotic medical systems. 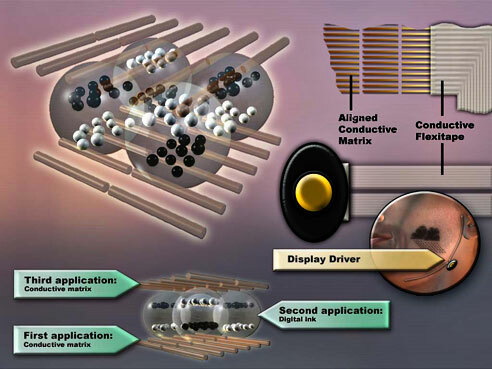 However, these display nanorobots and their sensing/networking kin have yet to be created. In the meantime, we may have to rely upon more traditional means to achieve such intimate displays. Inventor Andrew Singer, working for Paul Allen's Interval Research Corporation, had a similar medical application in mind in his 1997 patent for a "programmable subcutaneous visible implant." Also a display chip, it was designed to be implanted just under the skin and display bio-sensing readouts monitoring medical conditions such as diabetes -- though sans nanorobots. The device was designed to save precious time in an emergency. For under-the-skin implants, the thinner and more flexible the better. A "nano-skin" polymer film was recently shown by scientists at Rensselaer Polytechnic Institute (RPI). This flexible polymer infused with billions of carbon nanotubes is seen as making possible incredibly thin and flexible displays. Nanotubes are excellent electrical conductors and several research organizations are exploring their use in flexible screen displays. The nanotube-infused polymer is flexible enough to wrap around the end of a pipette. Finally, a technique for modifying subcutaneous tattoos using special inks has also been patented. It relies upon microencapsulated spheres injected under the skin. 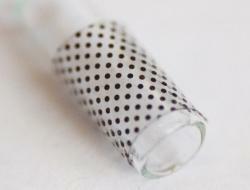 Such microencapsulation is typified by eInk's "digital ink" technology for use in electronic paper. 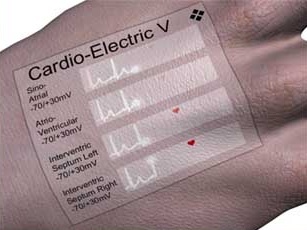 A set of drive electrodes manually applied to the skin manipulates the tattoo image electrically. A preferable design would be for programmable tattoos that were both continuously dynamic and tied into digital data displays. And if we could only avoid the needle! Take a photograph of yourself and paint a "digital tattoo" on to it with Photoshop or another paint program. It is an easy and painless way to judge if a real tattoo is "you." Better to make the mistake here than on your body. There are also tattoo appliques that can be digitally printed and applied on top of the skin, like the water-soluble decals available to children for decades. So why not apply programmable tattoos to the skin rather than implant or inject them underneath? In a speculative design that first appeared in Popular Science, tattoos are applied to the skin surface in three successive applications of a breathable cyanoacrylate film matrix similar to Liquid Bandage. First a matrix with conductive microrods is applied. Then a powered pad that aligns the microrods with an electromagnetic field is placed over the skin for a minute until the matrix is dry. This is followed by the application of a layer of digital ink matrix followed by another layer of conductive microrod matrix aligned at right angles to the first. Micro-scale rod matrix and digital ink matrix applied in layers. When suspended between the electrically charged grids the ink spheres can be made to display as either white, black or gray. Digital ink uses very low power and displays an image even when the power is turned off. Each sphere is about the diameter of a human hair and contains positively charged white particles and negatively charged black particles suspended in a clear fluid. Programmable digital tattoos would be the display component of a low-power Wireless Personal Area Network (WPAN). The WPAN's pocket-sized server would be capable of synchronizing with a Wi-Fi enabled PDA and allow for uploading of new calendar data, display drivers and display imagery icons. The second illustration shows an expressive icon, or emoticon, being displayed on the cheek. Knowing the emotional state of others is an important social skill. Some individuals excel at the subtle art of reading expression in the face and body. But to others less attuned or individuals with Asperger's syndrome (high functioning autism) expressions may be completely unreadable. This display provides those clues. Programmable tattoo applique with emoticons and messages. Beyond displaying emoticons to represent emotional state, it is also possible to have the system recognize your emotional state. Sensor-transponders employing fuzzy logic chips could be attached to the skin and sense medical conditions or interpret neural signatures (Lusted & Knapp) related to specific emotions. In this way, readings during emotional events can be stored, recalled and redisplayed. Users can review the date or place (using Wi-Fi mapping) where they last felt exhilarated, fearful, joyous or sad -- an emotional memory. The WPAN server uses wireless technology such as Bluetooth or UWB (ultra-wide band) to connect the components. But Korean firm KAIST reported this year the use of WPAN chips to achieve data rates of up to 2 megabits a second by sending data signals through the body itself rather than using either Bluetooth or other radio technologies. In addition to displaying emoticons, other uses could range from simple reminders to communicating in locations where ambient auditory noise interferes with normal communication. So for those who go "clubbing" in noisy nightclubs, you could communicate your mood, interest, disinterest or even favorite pickup line without saying a word! By connecting your PDA wirelessly to the Internet, it would also be possible for people to send you messages that you could then display on your skin. Or, rent your face to Nike during the local basketball game and display the "swoosh"! Artwork revisions courtesy of Gary Brandenburg. Lusted, H. & Knapp, R. (1996, Oct.). Controlling computers with neural signals. Scientific American, 275, 82-87. Gregory Daigle is a consultant in social technologies and e-learning and a former professor industrial design. He does not have any tattoos.